It is noticed that Every professional bloggers want at least one .edu backlink and .gov backlink for won blog.If you are a newbie then i am going to give a little idea of .edu and .gov backlinks.Here I am going to say first about backlinks.Backlinks are some url(s) has posted in other website or blogs which directly pointing to your site or blogs.I have already discussed about backlinks in this blog.Now I here .edu backlink means a domain which can be owned only by the education institute so they are not in a bunch like .com domains where your blog or site link is posted. Generally this type .edu has better Google Page Rank and search engine rankings.there for every blogger or webmasters try to get .edu backlink for own blog or site to get high PR and search engine priority.On the other hand .gov domains are directly owned by the government or any department of government.So the .gov domain also has high Page Rank and search engine priority.Here is the Six Steps Of Easy & Reliable Way to Get .edu & .gov Backlinks to Blogs & Websites. 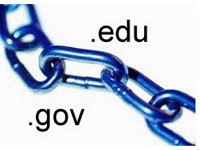 Normally maximum these .edu and .gov sites have disallowed "do follow" backlinks due to spammers.Such as no follow backlinks are not beneficial for your site or blogs.So it is a tub job to get .edu and .gov backlinks.Here I have find out a few method of searching Google for .edu and .gov sites which allows you to comment on their articles in which you can include an HTML code with a do follow link to your site. Firstly you have to choose or find some college, university or a school blog which has an .edu domain. Narrow down the search which allows us to comment. Give comment with useful and informative languages. Bookmark the commented site or blog for future check of comment approval. You can search in Google as site:.edu inurl:blog “post a comment” -”comments closed” -”you must be logged in” or site:.edu inurl:blog “post a comment” -”comments closed” -”you must be logged in” “seo” and find out the right niche to comment as above stated. It is must member that you must select right blog article of your niche, then leave a comment there with proper information and languages other wise your comment will never publish.So be sensible in leaving a comment in .edu sites or blog. It is similar to .edu baklinks process just you have to changes as .gov blogs, it is all the same, but instead site:.edu , you write site:.gov, everything else is the same. It is more difficult to get .edu and .gov backlinks to your site or blog but when you try with passion then surely get a few backlinks .These are my notions and own experience to do to get an .edu and .gov backlink for blogs and sites .But I am not sure you will surely get success but i think it can create wonders for your blog if you succeed in getting couple of backlinks from a blog which has higher pagerank and search engine priority.However try your luck and happy blogging.If you succeed in method don't miss to comment here. This is a good article. It's not only interesting it's compelling and you have written your views well. You have really done something good with this informative article. Thank you. Hmm it appears like your blog ate my first comment (it was super long) so I guess I'll just sum it up what I wrote and say, I'm thoroughly enjoying your blog. I as well am an aspiring blog writer but I'm still new to the whole thing. Do you have any points for rookie blog writers? I'd really appreciate it. Pretty element of content. I simply stumbled upon your website and in accession capital to say that I acquire actually enjoyed account your blog posts. Anyway I will be subscribing on your augment or even I achievement you get right of entry to constantly rapidly. Thanks for subscription.Stay in touch . I love using Google blog search and doing the methods and steps you mentioned above. Thanks for this post I really appreciate it! I just want to tell you that I'm very new to weblog and actually loved this web site. Almost certainly I’m planning to bookmark your blog post . You absolutely have outstanding writings. Kudos for sharing your web-site. I do not even know the way I ended up here, however I assumed this publish was once good. I do not realize who you might be but definitely you are going to a famous blogger if you aren't already ;) Cheers! I was more than happy to search out this web-site.I needed to thanks for your time for this excellent learn!! I positively having fun with every little bit of it and I've you bookmarked to check out new stuff you weblog post. Howdy every body. I was just browsing the internet for a great time and came on your website. Wonderful article. Thank you a lot for sharing your working experience! It's fantastic to understand that most people still put in an hard work into controlling their internet sites. I'll you'll want to investigate back again from time to time. I used to be very pleased to find this net-site.I needed to thanks for your time for this excellent read!! I definitely enjoying every little little bit of it and I've you bookmarked to take a look at new stuff you weblog post. Excellent goods from you, man. - BloggersTech:Perfect Bloggers Criteria To Leverage The Power Of Blogging Technology I've understand your stuff previous to and you're just extremely great. I actually like what you have acquired here, certainly like what you are stating and the way in which you say it. You make it enjoyable and you still take care of to keep it wise. I can not wait to read much more from you. This is really a great - BloggersTech:Perfect Bloggers Criteria To Leverage The Power Of Blogging Technology informations. Hi there. Basically would like to place a quick statement and inquire exactly where you received your particular web publication layout I am beginning own web page and tremendously appreciate your graphics. English Proverb: "A full cup must be carried steadily." Great goods from you, man. - BloggersTech:Perfect Bloggers Criteria To Leverage The Power Of Blogging Technology I've understand your stuff previous to and you are just too magnificent. I really like what you've acquired here, really like what you are saying and the way in which you say it. You make it enjoyable and you still take care of to keep it wise. I can't wait to read far more from you. This is really a tremendous - BloggersTech:Perfect Bloggers Criteria To Leverage The Power Of Blogging Technology informations. An newsworthy communication is designer note. I consider that you should make more on this matter, it mightiness not be a taboo person but generally group are not enough to speak on much topics. To the next. Cheers like your - BloggersTech:Perfect Bloggers Criteria To Leverage The Power Of Blogging Technology. An stimulating word is couturier note. I judge that you should correspond author on this substance, it strength not be a sacred master but generally group are not sufficiency to verbalize on specified topics. To the succeeding. Cheers like your - BloggersTech:Perfect Bloggers Criteria To Leverage The Power Of Blogging Technology. An impressive share, I simply given this onto a colleague who was doing a bit analysis on this. And he in reality bought me breakfast as a result of I discovered it for him.. smile. So let me reword that: Thnx for the deal with! However yeah Thnkx for spending the time to discuss this, I really feel strongly about it and love reading more on this topic. If attainable, as you change into experience, would you mind updating your weblog with extra particulars? It's highly useful for me. Large thumb up for this blog publish! I am just impressed by your work! Fantastic blog site! I like it! Thanks! Not too many people can write with such flair. You have impressed many people as evidenced by other comments made here. I, too agree with a lot of your content. Hey there outstanding blog! Does running a blog similar to this take a lot of work? I've absolutely no understanding of computer programming however I had been hoping to start my own blog in the near future. Anyhow, should you have any ideas or techniques for new blog owners please share. I understand this is off topic however I simply had to ask. Thanks a lot!